I’ve been to Beehive a couple times in the past and knew it’d be a great spot to take my parents when mom asked to go to a “fun and different” restaurant for our Valentine’s Day date. This South End hot spot has 2 floors: the 1st level consisting of a bar with seating and a small dining area, the basement level with another bar and larger dining space. The band of the night plays downstairs in front of a few small tables, but worry not, they can be heard throughout the restaurant and are actually projected onto a brick wall on the 1st floor for the upstairs patrons… neat! 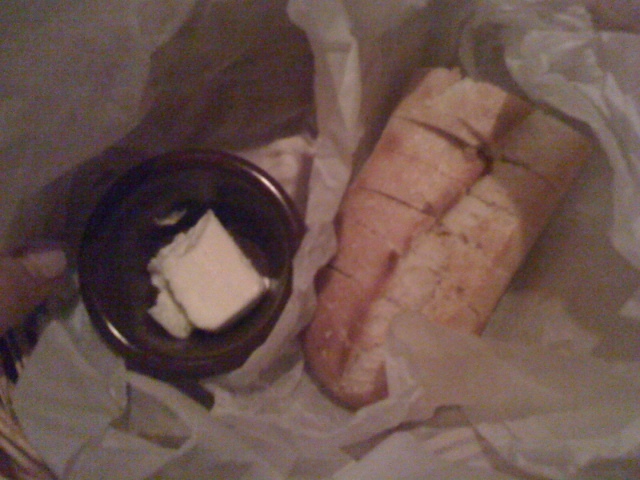 Bread: Served in an actual basket, the bread itself was wrapped in paper next to a container of soft butter. Not sure why it was covered up; it certainly wasn’t to keep it warm. Not that the bread was served cold, but we were disappointed in the small loaf/pieces. I think it took about 4 minutes for us to consume it and then ask for another basket. Menu: Plates (consisting of apps and flatbread pizzas), Raw Bar, Mains, Sandwiches & Dinner Salads, Sides. It may not sound like there are a lot of sections/categories, but each one had intriguing and unique dishes. Before we were seated Matt & I had a drink at the bar while waiting for my parents – the bar tender encouraged us to order the Shortrib Sandwich as an app as that was one of the few things (including himself and the GM) that “have been here since day one”. Sold. 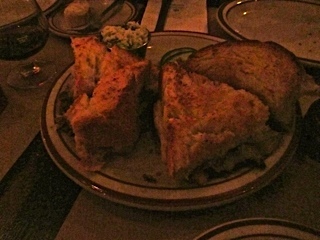 Served as an app, sliced into 4 pieces to share, the sandwich came with coleslaw and homemade pickles. This would have been overwhelming (for me) to have as an entrée; the bread was thick and doughy with the cheese melted on either side of the tender meat. Incredible as an appetizer! 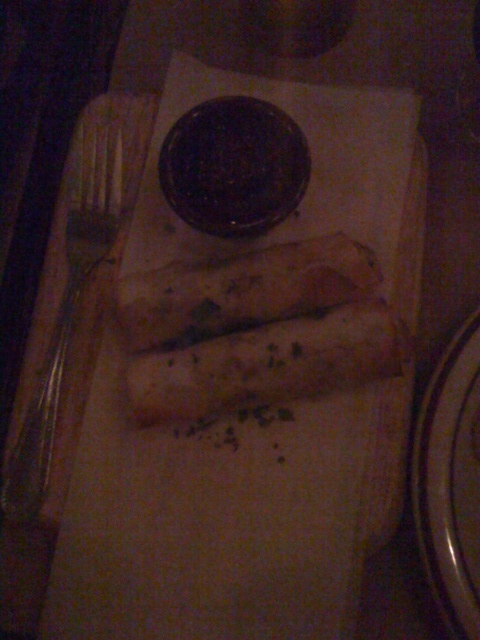 Two ‘cigars’ came side by side on a wooden cutting/serving board, with a sweet pepper sauce condiment. The phyllo was perfectly flakey, so good! Sometimes spring rolls can be greasy but that was not the case here. This was a special on the V-Day menu. 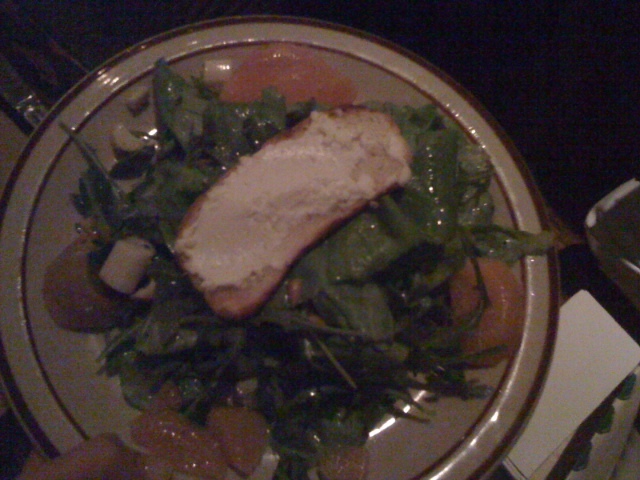 Topped with the goat cheese crostini, the greens were tossed with a light lemon vinaigrette mixed with pine nuts, fennel, & peach colored beets. I’ve never seen beets that color (I thought they were grapefruit at first) and they were delicious as ever, although I wish there were a few more. The salad was light and refreshing. Straight from Christina’s (www. christinasicecream .com ) in Cambridge’s Inman Square, famous for its incredible ice cream and 50 flavors. 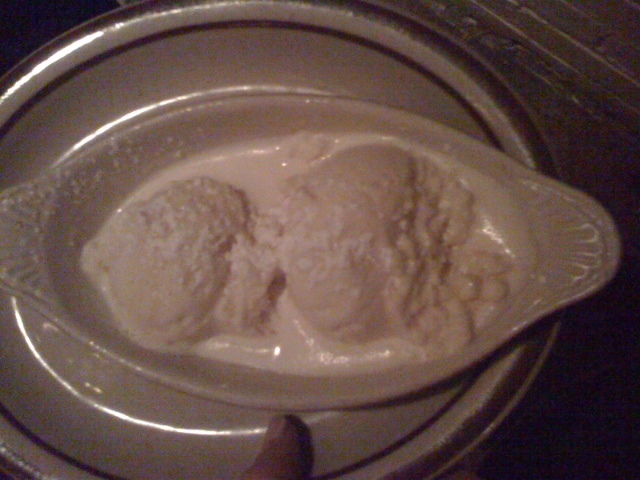 We ordered 2 for the table – each came with 2 scoops topped with a sprinkle of powdered sugar and was almost ½ melted! The ice cream was soft which is fine, but definitely too soupy. I can’t deny that it was delicious though. Bathroom: Yay! Something bright, fun, and eccentric! 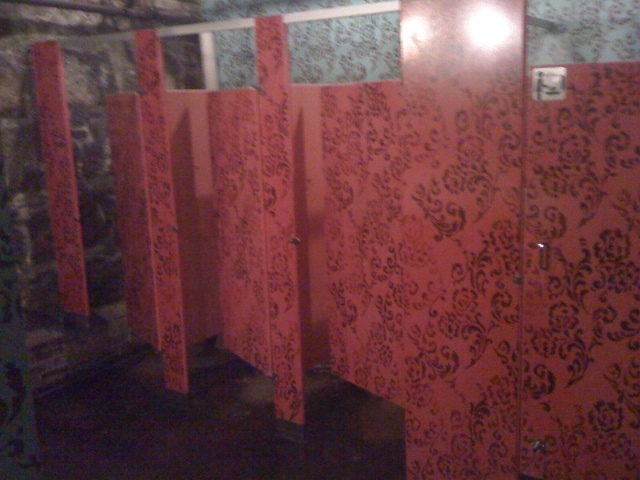 The waitress informed us that her friend actually painted the bathroom, which is impressive since every stall and almost every wall is covered in intricate flower designs (perhaps she used stencils?). 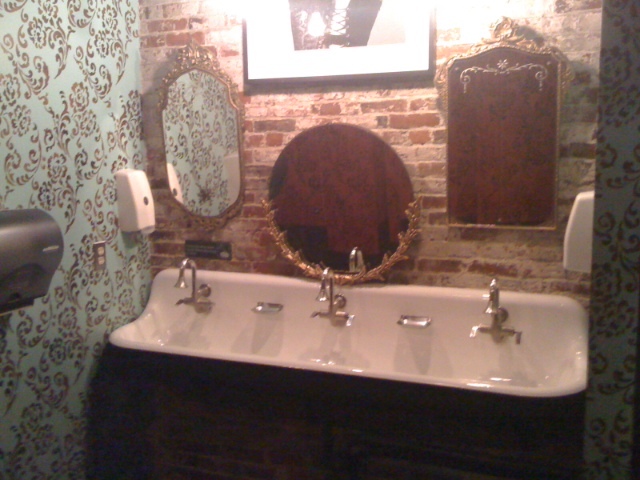 There were 3 old fashion mirrors hanging on a brick wall above the trough of a sink. Very impressed! Wait Staff: Jodi was a blast. She was fun, positive, and full of energy. And thankfully was not offended after my dad asked how she created and maintains her dread locks (good grief old man!). She was able to educate us on the menu and it seemed like she genuinely enjoyed her job, which made me genuinely enjoy her. Overall: I highly suggest you try Beehive, not only for the great food and service, but it’s a great change of pace and provides live music almost every night of the week. It’s perfect for a night out with your girlfriends, a casual dinner date, or grabbing a drink and enjoying a live show. The Perfect Bite: This is really tough, but I think I’ll go with the Moroccan Cigar topped with sweet pepper sauce. you didn’t embarrass me! i just thought it funy – a typical Phil inquiry. you were very polite and not at all rude about it! Definitely would go back to The Beehive- I thought it was great!! My Cod with broccoli rabe was excellent…. Loved “Jody” the waitress – she was refreshing! Hey, Hey! Colleen and I go to the beehive all the time. The brunch there is great – and they also have live music on Friday and Saturday evenings – mostly jazz. Reservations are a must, it’s rare you can just stroll in and get a table. Hi Dena! Sooo – I work at Meditech w/ your dad and he gave me your website to check out … This is awesome! You have some great places on here. I saw the Beehive and have to say it’s one of my fav. My friends and I go here for pre and post drinks/apps when the ‘Girls Night Out’ comes to the Cyclorama. ALSO what is cool about this place it a dining scene from ‘My Best Friends Girl’ was filmed there. (You can tell by the bathroom decor).